Don't wait another day to start changing your life. 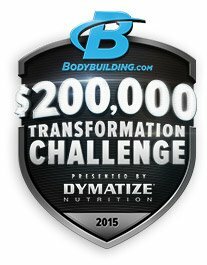 Register for our $200,000 Transformation Challenge today! Get ripped and rewarded in 2015! Buzz around the Internet is that Bodybuilding.com (that's us!) is giving away $200,000 in prizes to those who are dedicated to transforming their bodies, changing their lives, and becoming their best selves. During this three-month-long transformation challenge, starting January 12 and extending through April 5, we are challenging people to work out and eat better. That's it. No tricks or gimmicks—just hard work, and a hard body to show for it. We're providing you with all the tools you need to get started, to stay motivated, and to succeed. From 12-week workout plans complete with nutrition and supplement schedules, to thousands of articles on anything you can dream of, you have everything you need at your fingertips. But hey, we understand that the registration process can be scary. But what else is there to lose (other than some pounds)? We want to get you on the path to change, once and for all. It's time to stop wishing and start doing. The question is: Are you in? Head to the registration page and follow the five steps below to make registration a cinch! A BodySpace account gives you further access to our massive online community, where you can talk shop with thousands of other transformers across the globe and make lasting friendships you never thought possible. It's also a great way to stay motivated as you upload progress photos, track your workouts, log your food, and draw inspiration from hundreds of photos. 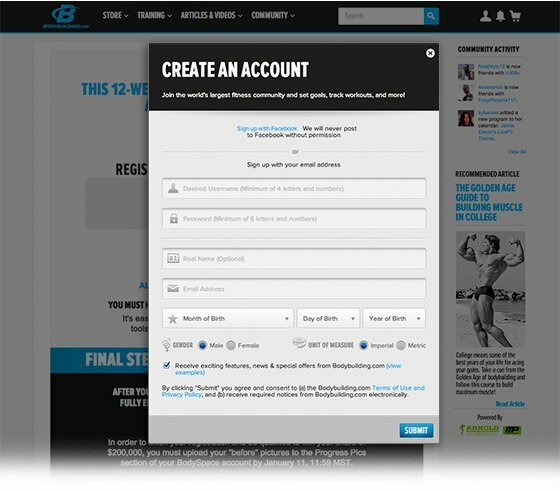 If you're new to BodySpace, you'll have to enter a valid email address. Afterward, you'll receive an email with a verification code to prove that you're actually a human being and not a robot. Then return to the registration page and click on the "Register Now" button. Taking progress photos can seem daunting at first, but beyond the contest's purpose, they're crucial for establishing a starting point. Three months from now, when you look back at your starting photo, you'll be blown away by how much your body has changed, how much you have grown as an individual, and just how far you've come. Simply have a family member or friend take a photo of you in gym clothes (preferably with your shirt off for men and a sports bra only for women) from the front, back, and side. Phone pictures will be fine, but if your photos are excessively blurry, they may not be acceptable. Take a couple just in case! We encourage you to take as many progress photos as you'd like throughout the process, but to be eligible for the contest, we only require that you take the first "before" photo with a newspaper dated before January 12 or a paper with #200KTransform written on it. 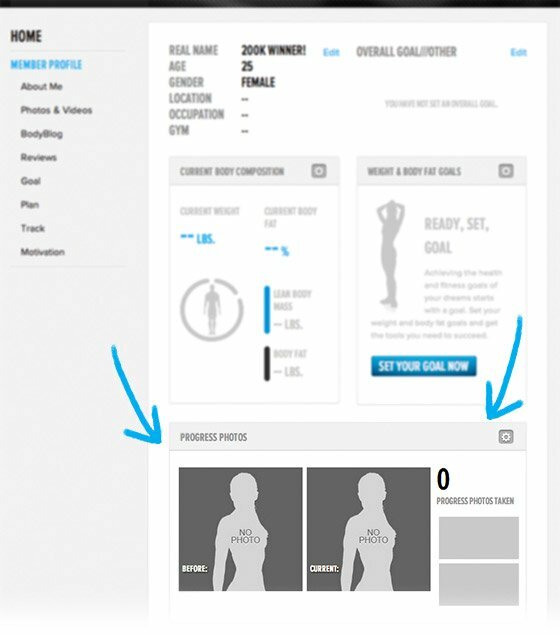 With the newly redesigned BodySpace, your profile will feature all of your visible profile information. Access your profile by clicking on your BodySpace icon in the header to bring up a drop down menu (as shown in the picture below). Scroll down to where the box says "Progress Photos" and click on the cog icon to find an option that says "Upload New Progress Photo." You can upload multiple photos. Be sure to mark them all as "before" photos in the gray box and insert a title (required) for each. For example, "Front Relaxed" would suffice as a title. The final step is to adjust the photo so that what you want to show is visible to others visiting your profile. You're all set for the Transformation Challenge, but now you need a plan of action—a blueprint for success. Thankfully, we have dozens of workout plans created by renowned and respected fitness experts—such as Jim Stoppani, PhD; Kris Gethin; and Jamie Eason—that will cater to every goal. Whether you want to build muscle, lose stubborn fat, or just feel better, we have something for everyone. Not to mention our vast library of totally free articles on nutrition, training, motivation, music playlists, and more! Don't let another day pass; don't be that person who, three months from now, wishes they had done something—anything—now. Try these superb shakes and mix things up with fresh ingredients and a variety of supplements. Check out the top writers, articles, videos, photos, and more from 2014!